Like many of you, I’m constantly juggling what seems like a bazillion projects. At times, my home office can begin to suffer from paper clutter chaos, when I’m working on several different active projects within the course of a week. 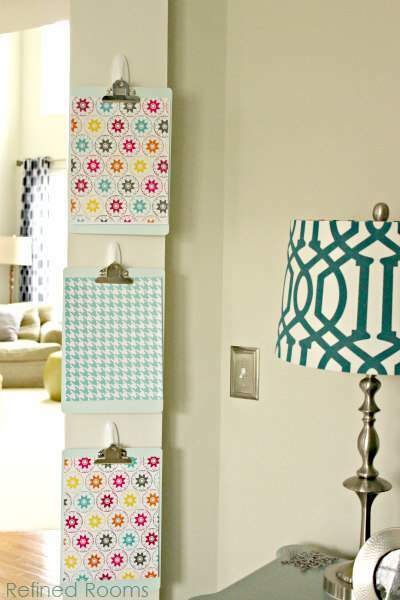 When I found myself using the floor surrounding my desk to pile up my various project papers, I knew I needed to come up with a better paper organizing solution. You may remember from my recent Home Office Redesign Project Reveal that there are several pillars that flank the entrance into the office. So I decided to take advantage of that vertical space and create an active project center on the pillar located behind my desk using two tried-and-true organizing tools–clipboards and Command Hooks. I found these babies in the dollar spot of my local Target store for $3 a piece. I plan to use the white ones for another future project, but those blue ones had “Natalie’s Home Office” written all over them. These were awesome because they had the perfect hole for hanging on a Command Large Wire Hook (a medium wire hook would work as well, but I had a supply of the large wire hooks, so that’s what I chose to use). I’m so excited to have an easily accessible place to store all the papers associated with my most current active projects. Since my office is in a really public area of our home, I pulled out a few pieces of scrapbook paper that I had on hand and cut them to size to act as a cover to hide the papers. Not only is it functional, now it’s pretty too. That’s the goal, right? When I have a bit more time, I plan to swap the everyday scrapbook paper out for some coordinating holiday printables to bring a bit more holiday flair into the space. 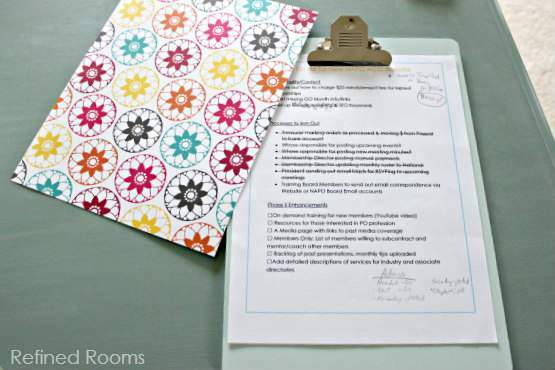 When I’m ready to work on one of these active projects, I just grab the clipboard, sit down at my desk, and get to work. 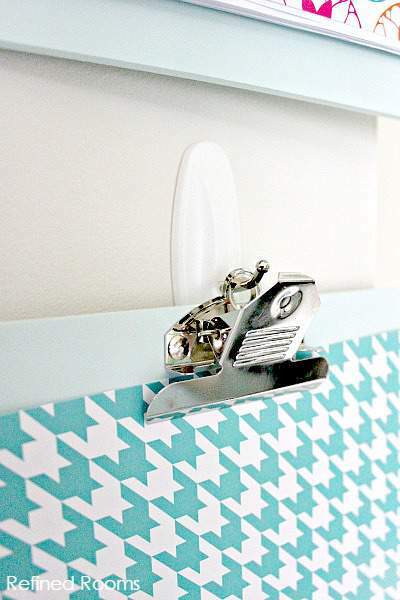 I’ve always been a fan of clipboards…now I can see myself evolving into a Clipboard Junkie as the ideas for clipboard organizing in the rest of my home multiply by the day. 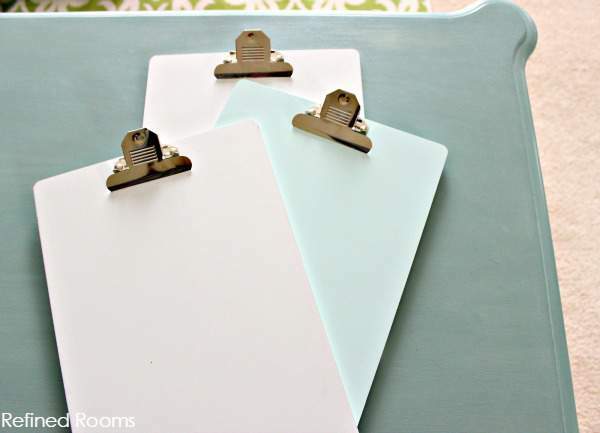 How have you organized with clipboards in any room of your home? How have YOU used them?